Emoji can be useful to make workplace communication friendlier and less abrupt. When used in moderation and in the right context, it can bring people closer together. If you spend any time on social media, you have seen your share of emoji—those little pictures of yellow smiling faces, cups of coffee, and soccer balls. (The older term, “emoticon,” refers to the ones that are done with typographical images, like this: :), while an “emoji” is the actual little picture: , of the kind you find on your smartphone ready to click on.) It’s likely that, if you see yourself as a serious person of the world and not a pop singer or a teenager, you aren’t in the habit of using them yourself—and especially not in business communications. “Your team has fallen short of objectives ” doesn’t go over all that well with most people, after all. 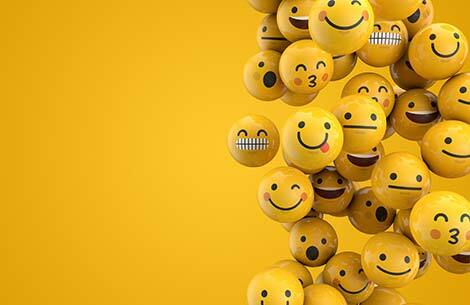 But what if you thought of emoji differently—as a new and interesting tool to bring you closer to people and humanize your interactions with them? I’m a strong believer in the power of music. I play the guitar, as you know if you’ve read my book Greater Than Yourself, and I realized a long time ago how it brings people of all different backgrounds together in a unique way. What if I had stopped playing at age 21 because I thought I was too mature and serious? I would have missed out on, well, first of all a lot of fun, and second of all hundreds of opportunities to connect with other people that have made me the person and the leader I am. The lesson I take from that is, I’m not going to dismiss any new tools, and that includes little pictographic icons in texts, before I’ve figured out a way to use them in service of other people. Here are three ways to open your mind about emoji in business. Emoji can clarify and amplify your message. They can add an element of fun to routine correspondence. When you’ve slogged through email/text/memorandum number 549 for the day, it can be nice to read or send one short, sweet “Let’s Do It!” message with some variant on the smiley-face emoji. We’re not talking Cher-on-Twitter levels of emoji, just the occasional warmup when you’re on Slack or any other messaging platform in the office. They can help you come closer to millennials and people in the communication sector of business. The dictionary people add and change the contents of their books pretty regularly, because the language grows and adapts over time. They might not have been around in 1980, but emoji are around now, and people, especially younger ones, have gotten used to them and don’t find them jarring or offensive. Speak their language. Likewise, people in creative fields like advertising and graphic design are already using emoji and GIFs and every other graphic image they can get their hands on. Join them! The creativity will spill over into other areas and make it feel that much more OK to think outside the routine in other departments. Anything to worry about? :O You need to know what the emoji pictures really mean and how they’ll be interpreted before you put them into your messages. Look them up on Emojipedia (yes, there is such a thing) or Urban Dictionary if you aren’t absolutely positive. Maybe you grow your own eggplant and want to brag about it, but don’t use the eggplant emoji at work anyway. Trust me. Do use as many positive ones as you can, but be mindful of your own place in the organization and set the example of class and style that goes along with your role. I’m hoping that class and style can leave room for a :), or in your day.